Rugby Town Junior Football Club are delighted that local boys Ben Wilson and Sam Collins are the latest in a long line of youngsters that have developed into referees. Supported by the club who paid for their course, local businessman Andy Wilson has also sponsored the boys and bought them their referees’ equipment. Liam Coulter, the club’s Chairman said: “We are always delighted to support the development of our young people and Ben and Sam have contributed over 200 hours of their time to the club. “These hours have helped the club develop more teams at Under 7 for season 2016/17 and have also helped the boys develop as a coach. “The club are also sponsoring them on their Level 1 course once they both become 16. Andy Wilson, who runs ASW Vending, said: “When the club emailed me and asked me about helping the boys out with their referees’ kit I was delighted to do it. 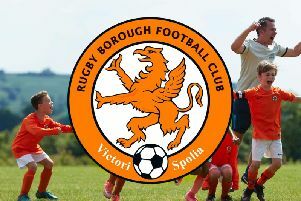 The club are in the process of setting up a Youth Council with girls and boys aged from 14 to 23 invited to form a group to take away some of the workload from the main Committee. Anyone with an interest is asked to phone Liam on (01788) 568500.